In biology, schooling fish are any group of fish that stay together and swim in the same direction in a coordinated manner. Why Aquarist love schooling fish? One thing that makes this type of fish particularly interesting for aquarists and others is the beauty of schooling species. The way they move close to each other while keeping in perfect rhythm is incredible. It is like they are being operated from one mind at the same time—all in your home aquarium! Whether you keep them alone (Really not advisable for a schooling fish) or with other fish species, they will surely entertain you and boost the activity in your tank. This fish got its name from the red blushing mark that stretches across its mouth and face. They are one of the most popular tightly schooling fish and are a great sight to watch in any aquarium. 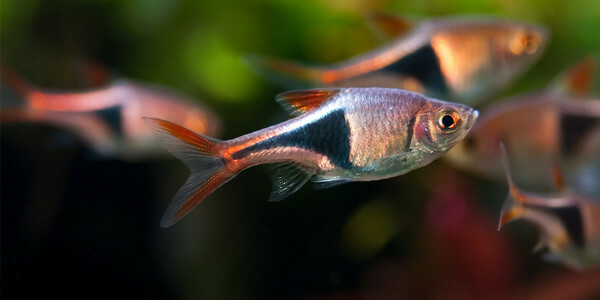 They lack in color in comparison with other types of tetras, but their silver body and black tail make them just as beautiful. They do best in schools, but they also hide alone in appropriate spots occasionally. Keep in mind these fish are highly sensitive to temperature and pH fluctuations. The best water temperature for rummy-nose tetras is anywhere between 72-77⁰ Fahrenheit with a pH of 5.5 – 7.0. This fish is often underestimated as a possible easy schooling fish for a freshwater aquarium. They are hardy, incredibly active, and colorful. They are also easy to breed, which is good for beginners. The chief liability of this fish is their small size—only 1.5 inches. White cloud mountain minnows prefer water temperature range from 65-75⁰ Fahrenheit. Experts believe they can withstand temperatures anywhere between 50-90⁰ Fahrenheit for short periods of time with slightly soft water pH 6.0 to 8.0. These easy schooling fish are far too beautiful to pass on when choosing your schooling freshwater aquarium fish. It has a glowing, bright blue stripe across the entire length of their body and another red stripe just under the blue one. Their natural habitat is in Brazil where they are caught wild and exported to other parts of the world. They are small in size (they grow up to 1.5 inches) and are great to watch while swimming. 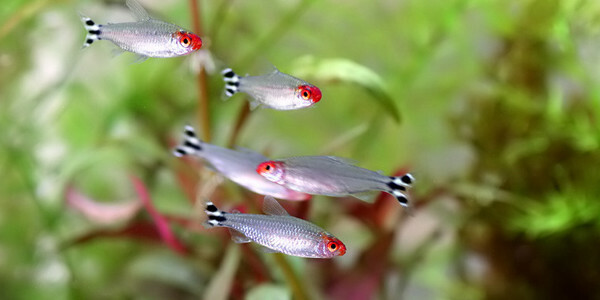 Being schooling fish, cardinal tetras do best in groups of at least six. 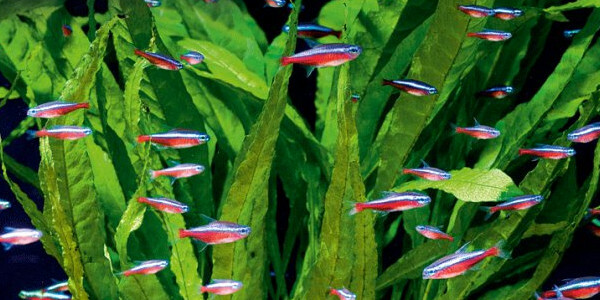 Ideal water temperature for cardinal tetras is between 73-81⁰ Fahrenheit with a preferable pH is from 5.5 – 7.5. Another popular easy schooling fish is the Harlequin Rasbora. The black triangular patch found near the fin easily distinguishes these fish. They are mostly kept in groups as they enjoy the company of other fish. Together they form tight schools and are always on the move—a beautiful sight in any aquarium setup. They tend to keep themselves at the top of the tank, while swimming in circles with unmatched elegance. They are considered to be small fish, given the fact that they reach 2 inches at maximum. Beautiful, lively, small and easy to keep makes these fish an absolute favorite for many aquarists around the world. Their hardiness and simplicity makes them a good choice for beginners, too. They like temperatures between 73-85⁰ Fahrenheit and a pH range from 6.0 to 6.7. 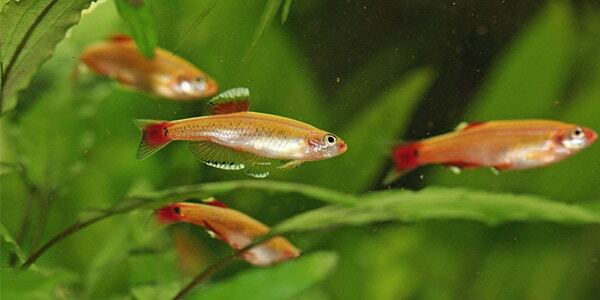 Cherry barb originates from its natural habitat in tropical waters in Sri Lanka. The body of these fish is silver/black with a golden horizontal stripe that stretches across the body. 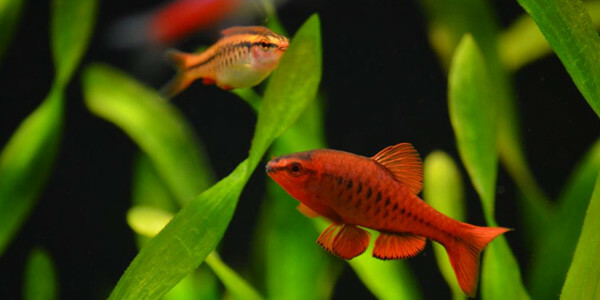 Cherry barb got its name because males turn deep red during spawning times, so their color resembles the one of a cherry. It is a peaceful, yet hardy species and it does not take much to learn how to care for them. 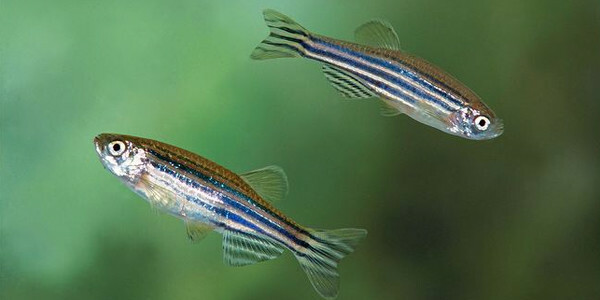 They tolerate a wide range of water parameters, which can be great if you are a beginner aquarist. Find out other fishes that are easy for beginners. Cherry barbs are small fish as they grow to 2 inches at most. They do best when kept in schools of 6 and more fish. Ideal temperature for cherry barbs is anywhere from 73-80⁰ Fahrenheit and pH range between 6.0 – 7.5. Zebra danios are another easy schooling fish and they are easily recognizable due to their striped zebra-like pattern. They are most often gold or silver with blue or purple stripes stretching all across their body. They dwell close to surface and are extremely active swimmers which makes them a beautiful sight to watch while in action. This fish is both inexpensive and hardy, which makes it a great fish for beginners. Today they are selectively bred all across the world, so there is plenty of variations to choose from. Temperatures for zebra danios range between 64-75⁰ Fahrenheit. They prefer slightly acidic water as the ideal pH for their keeping is anywhere from 6.0-7-0. Schooling fish are a wonderful addition to any tank as they bring life and excitement to every aquarium. If you are planning to have a school of fish in your tank, do consider the size of your tank to determine the number of fishes you can have. You do not want to overpopulate your tank in the process of wanting a school of fish. I’m getting away from cichlids and going to Startup a 110 gallon Community tank and I want at least two to three schools of fish and others do you have any ideas? Your heater will make sure your tank is the perfect temperature. It will turn off when the temperature gets too high. It will turn on when it’s too low. I have 6 Inch tin foil barb in my aquarium I want to add a school or two which fish do you recommend.